I have one more project to share for 2018… squeezing this in before the end of the year. 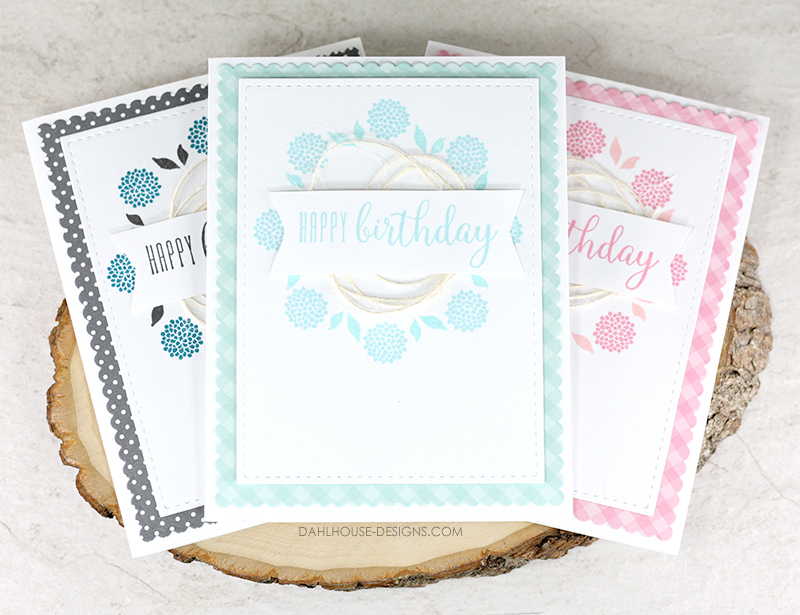 I’m excited to be using the co-branded Gina K. and Unity Stamp Company stamp set for this sweet and simple card. I’ve created a quick video tutorial on how this card was made. You can watch it below or on YouTube. Like this video? Please give it a thumbs up and subscribe. You are going to think I’m crazy, but I tried so many different wreath ideas. Many colors, lots of stamps and they just weren’t speaking to me. They were all lovely, but they were just not me. I decided to simplify the pattern and the colors and then I was instantly in love. I’ll admit it, I’m a simple girl. I like simple things. I could have kept going with these and most likely will revisit the idea again. I loved playing with the different colors and papers. It will be a great way to build up my stash of cards for different occasions just by changing the sentiments. Start with a standard size A2 card (4.25″ x 5.5″) card. 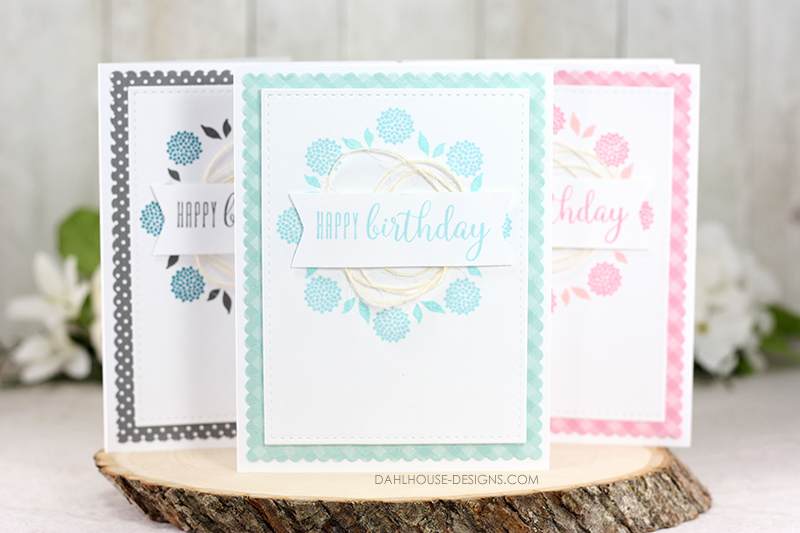 Die cut a patterned piece of paper in a scallop pattern and adhere to the card front. Place the smaller Gina K wreath builder template in a MISTI or stamp platform. Secure with tape. Die cut a 2-inch circle and line up in the center of the template. Cut a 5-inch square of white cardstock and place into the template. Stamp the flower and leaf wreath using the wreath builder template in two ink colors. Die cut the finished wreath with a stitched rectangle. Adhere to card front with foam adhesive. Stamp sentiment on a piece of white cardstock and notch the ends to create a banner. Wrap some string in a few loops and lay down on the card. Adhere sentiment banner with foam adhesive over the string to secure it all to the card. Call ‘er done and admire your beautiful card. Thanks for joining me today. I hope you are inspired by today’s project. If you create something, I’d love to see. Join us in the Unity Show & Tell Facebook group to share your card and tag me. Affiliate Links are used when available at no additional cost to you. I greatly appreciate your support of my little blog. Stamp of the Week Unity Stamp Company Wanna Sketch? These are so subtle and sweet Lisa! Happy New Year to you my friend, wishing all the best things in 2019! I generally find simple is better, too, and these are so pretty! And not as simple as you claim. 😉 There’s lots of interest to each design. Lovely cards Lisa. I always enjoy visiting your blog. Such beautiful creations. Your blog is so pretty and well displayed. Welcome to my blog for all things card related. I'm a blogger, card maker, and designer. I hope to create with you, share with you and inspire you a little too. Original artwork © Lisa Arana | dahlhouse designs is shared for your personal inspiration and may not be used for publication, submissions or design contests. You are more than welcome to copy/CASE my projects for your personal inspiration, I would love to see if you are. Thank you. Unity Stamp Company has generously provided me with free and/or discounted product for use in my creations. Affiliate Links are used when available at no additional cost to you. I greatly appreciate your support of me and my little blog.